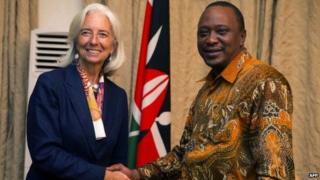 The International Monetary Fund has agreed to make loans of around $700m (£460m) available to Kenya. The money will be used as an insurance policy to protect against any threats to the country's economy, considered a financial powerhouse in East Africa. The funds will be available for the next 12 months. The ministry of finance has told the IMF it doesn't intend to use the funds. Instead it will act as security against "economic shocks", the IMF said. It is worth remembering the economy is doing well, last year it grew by 5%. The Kenyan government would say it's being prudent, guarding against any natural or man-made disasters. For example, Kenya faces a terror threat from al-Shabab, the Islamist militants who killed murdered more than 100 people last year in raids across the country. This has already badly damaged the country's tourism trade. However, this insurance policy comes at a price. The government has to commit to follow IMF rules. These include managing debt levels, commitments on big infrastructure spending when it comes to improving road and rail networks and meeting inflation targets.